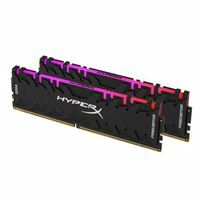 HyperX Predator DDR4 RGB pairs brilliant RGB style with dazzling performance. Easily create your look with HyperXs Infrared Sync technology, no cables required. Predator DDR4 RGBs CL17 latency and speeds up to 3600MHz provide a powerful boost.